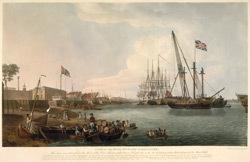 Artist and engraver: Dodd, R.
View of the Royal Dockyard at Deptford ' taken from the Shore of the River Thames, at the time a Frigate was in the Act of taking her Masts alongside the Sheer Hulk'. An accompanying note explains 'Deptford is not the most Ancient of his Majesty's Yards, but at present is the greatest of the Royal Arsenals for the reception of Naval Stores; great quantities of which are constantly deposited here, and from its nearness of situation to the Navy Board is generally termed the first Royal Dockyard. It is repleat with Launches for Building with dry Docks, and a large wet Dock, in which the Royal Yachts are laid up when not on Service. Adjoining is the Bakehouses and Slaughtering houses, which makes it of Importance both for Equipping and Victualing the Royal Navy'. The building to the far left, it one of the great storehouses.